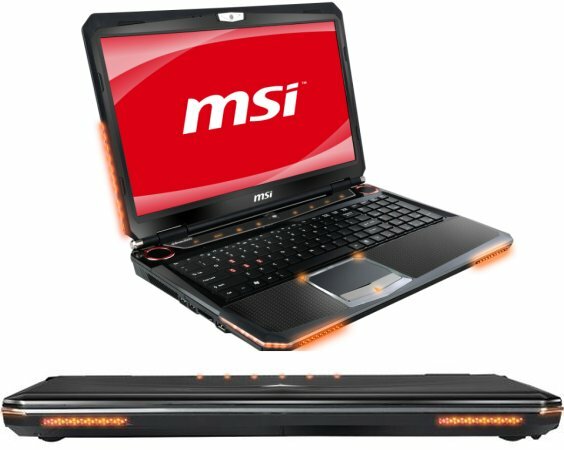 MSI introduced the GT683, a 15.6" Full HD laptop with NVIDIA's GeFroce GTX 560M. Other specifications include the Intel Core i7 2630QM, Windows 7 Home Premium, 8GB DDR3, 640GB 7200RPM HDD with RAID 0 support, 802.11b/g/n WiFi, DVD burner, Bluetooth, 4-in-1 memory card reader, 7.1 THX TruStudioPRO sound, two speakers + subwoofer, 2MP webcam, eSATA, HDMI, two USB 2.0 and two USB 3.0 ports, and a 9-cell battery that should last about 3 hours on a single charge. The system measures 395 x 265 x 35-46mm and weighs 3.5kg. MSI, the world-class manufacturer of notebooks is proud to introduce the GT683 G-Series notebook, the first Gamers Notebook driven by the latest NVIDIA’s GTX560M with 1.5GB of Memory, plus Intel® New Generation Core™ i7. The best sound quality thanks to the combination of Dynaudio speakers and THX TruStudioPRO™, will give the best experience on this notebook while playing games. The powerful mobile Core i7 combined with MSI’s unique Turbo Drive Engine and MSI’s Cooler Boost technology ensures that you won’t ever be lacking in the performance department while keeping your system cool. To propose the best experience while playing games, MSI is the first manufacturer to integrate the latest Nvidia’s GPU GeForce GTX560M with 1.5GB DDR5 memory in its platform. With its impressive performances, the MSI GT683 is the perfect sidearm to compete in the latest games, performing all DirectX 11 visual effects and Nvidia PhysX technology, which offers realistic interaction for deeper experience while playing games. The MSI GT683 features Intel’s most advanced Intel® 2nd Generation Core™ i7 quad core processor for better performance. Furthermore, new generation Turbo Boost 2.0 technology greatly boosts the computing capabilities of all cores, while the Quick Sync Video technology enhances multi-media file computing performance during conversion, synchronization, and compilation. The GT683 supports the unique Turbo Drive Engine technology to boost the performance of the graphics. With just one touch of the highlighted Turbo hotkey the graphics performance is instantly boosted. The GT683 makes sure that the best power is available when you need it. MSI Cooler Boost is another awesome feature which again is used with the push of a button. With the Cooler Boost engaged, the GT683 will use advanced variable fan speed control to keep your system as Cool as possible, without sacrificing performance. The GT683 features the best quality speakers you can find in notebooks. MSI cooperated with Dynaudio to translate countless studies and many months of design to determine the ideal location of the speakers. The high quality sound output is combined with high quality surround sound input through THX TruStudioPRO™. To provide gamers with the most powerful machines possible, the new generation GT683 comes with four slot DDR3 configuration for a maximum of 16GB, giving you an notebook with the memory capacity of a server. Coupled with two hard drives with RAID 0 accelerated dual architecture not only doubles the GT683’s hard drive memory capacity, it enhances read-write speeds up-to 70%. The MSI GT683 features USB 3.0 technology, which supports transfer rates up to 10 times faster than traditional USB 2.0. This means that you can transfer high-definition data including movies, videos, and other large file formats – faster and easier than before – so you can enjoy the experience with minimal interruptions. The GT683 notebook features powerful multi-media processing and MSI’s own CinemaPro technology for the best possible graphics. A touch of the CinemaPro hotkey instantly switches to video mode for higher resolution and richer colours to bring you the same great audio experience found in live performances, films, and recording studios. MSI’s all new GT683 is not only the best choice for serious gamers, it is a powerful multi-media center. The MSI GT683 is equipped with MSI’s own i-Charger technology. More powerful electrical current to the USB speeds up recharging more than three-fold. This way it doesn’t take nearly as much time to get your mobile devices up and running again.